The 1852 Hauge Log Church Preservation Association was honored to have the great-grandson of a pioneer Hauge Church pastor in attendance at it's 2019 annual membership meeting. Mr. Robert Lewis, now in his 90's, is the great-grandson of Peder J. Solberg, who served as pastor of the Hauge Church from 1872-1879. Robert recounted that he had been reared on a farm in Trempealeau County, Wisconsin that had originally been settled by his great-grandfather. Pastor Solberg died before Robert Lewis was born but still had a profound influence on his life. He remembered his parents and grandparents talking of the values Pastor Solberg had - he was a wonderful family man, a progressive thinker, a public servant and the town chairman. For those interested, a more detailed history of the Solberg family is available here. Taking advantage of the relatively warm weather and lack of snow, a record 40 people attended this year's Hauge Log Church Christmas Hymn Sing which was held the evening of December 16th, 2018. 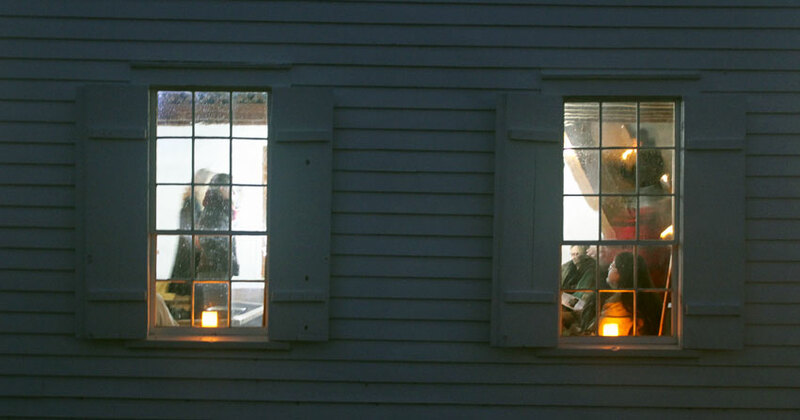 Battery-operated lanterns and candles provided a soft glow for recounting the Christmas story and the singing of traditional carols. 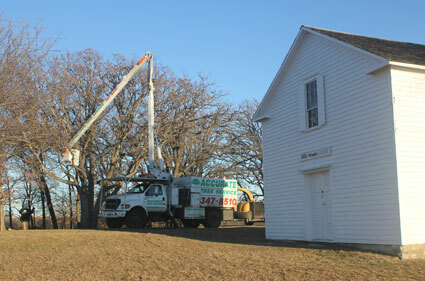 In mid-December, 2018 the Preservation Association brought in a professional tree service to prune a number of the beautiful oak trees on our grounds. Over the years many of the trees had developed dead limbs and branches which needed to be removed for both the safety of our visitors and health of the trees. To avoid the spread of oak wilt disease, oak trees shouldn't be trimmed until late in the season after the first hard frost, making it prudent to wait to complete this task until after the site was closed for the winter. Recently an archaeological survey team from Lawrence University in Appleton, Wisconsin consisting of Professor Peter Peregrine and four students arrived at the Hauge Church site to conduct a survey of the cemetery grounds. Established in 2009, the Lawrence University team focuses on locating unmarked graves in pioneer cemeteries using a non-invasive geophysical technique which detects tiny variations of the earth's magnetic field that may indicate buried materials, such as a grave site. Using a transit, they got started by setting up and marking an initial GPS reference grid consisting of 20 by 20 meter (about 65 by 65 feet) squares. Once that was done small wooden pegs were put in the ground spaced exactly one meter (about 3 feet) apart along the North and South sides of the first square. Lengths of rope were strung from each peg across to the matching peg on the other side of the square. Using a sensitive device called a magnetometer a complete scan of each quadrant was made by carefully walking back and forth following the rope markers. It was also important that no one had any metal or batteries around nearby as this would interfere with the sensitive device's readings. At the end of the day the stored data was transferred from the magnetometer to a computer for further processing, the end result being a detailed picture of what lies beneath the ground. Once all of the data is fully analyzed the Hauge Association will receive a complete report which will allow us to pinpoint lost graves based on their magnetic signature. 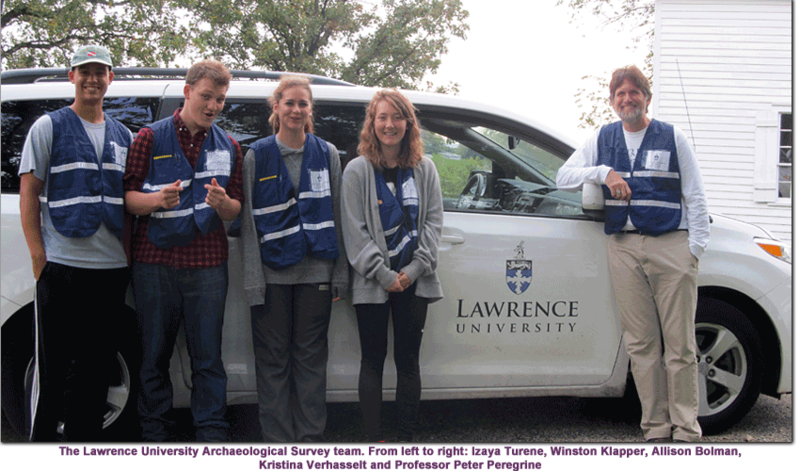 The Lawrence University grave survey team returned to the Hauge Church cemetery for a second time to complete a more detailed scan of the area located immediately north of the church building. Analysis of data obtained during their first scan of this area seemed to indicate a large number of unmarked graves spaced very close together, but more information was needed. During their second trip the group concentrated their efforts in the area between the church building and the north fence line in order to create a more accurate picture of what might be located there. A follow-up report to the Hauge Preservation Association indicates the likely presence of some 18 unmarked graves located in the area north of the church building. Because of their location and the unusually close spacing it is believed that these are children’s graves resulting from a diphtheria outbreak which took place in the late 1800s. 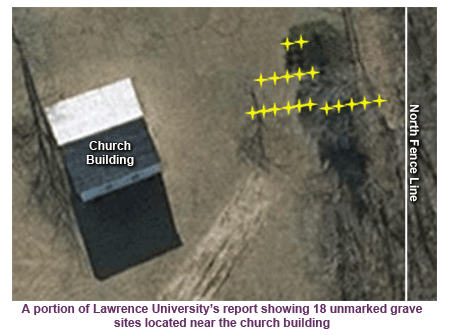 All told some 60 unmarked grave locations were pinpointed in the Hauge Cemetery by Lawrence University. Since early burial records from the cemetery no longer exist there is no way to associate names with the unmarked sites; however the Hauge Preservation Association does plan on placing a marker at each location so they aren’t forgotten in the future. The new markers consist of a marble slab (donated by Habitat for Humanity of Baraboo) set into a concrete base, with a small brass cross placed on the surface. The entire unit is set flush with the surface of the ground for ease of mowing and care.